Computer boots like normal, Windows loading screen will appear, after a few seconds, a quick blue screen will appear and then your computer restarts. You can't even read the BSOD information because it just flash in less than a second. This will go on and on and you will be stuck in a loop. Computer will not boot even in safe mode or any other option. 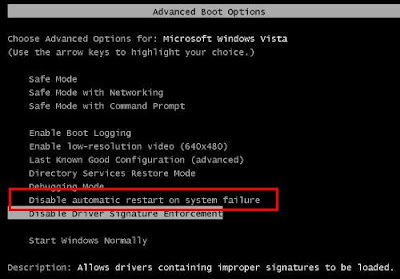 (this image is from Vista but it's basically the same) What you need to do is choose the option: "Disable automatic restart on system failure" (the one in the red box). 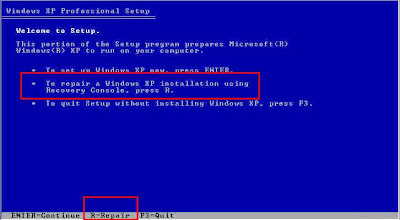 After doing that, your computer will restart, and you will now see the Blue screen error message. For some, the only solution when you see this error is to reformat the hard drive. But this problem can be easily repaired by using the built in Window Tool "Chkdsk" or checkdisk (same as scandisk on older windows version). What you need is a Windows XP installer CD, put in you CD Drive, boot your computer from it. You will now get to the command prompt. . Type chkdsk /p and hit Enter. This will launch a utility which will check for errors on your hard drive, it will take a while, just be patient. When it is finished, remove the installation disk on your cd rom drive, type EXIT and your computer will now be back to normal.